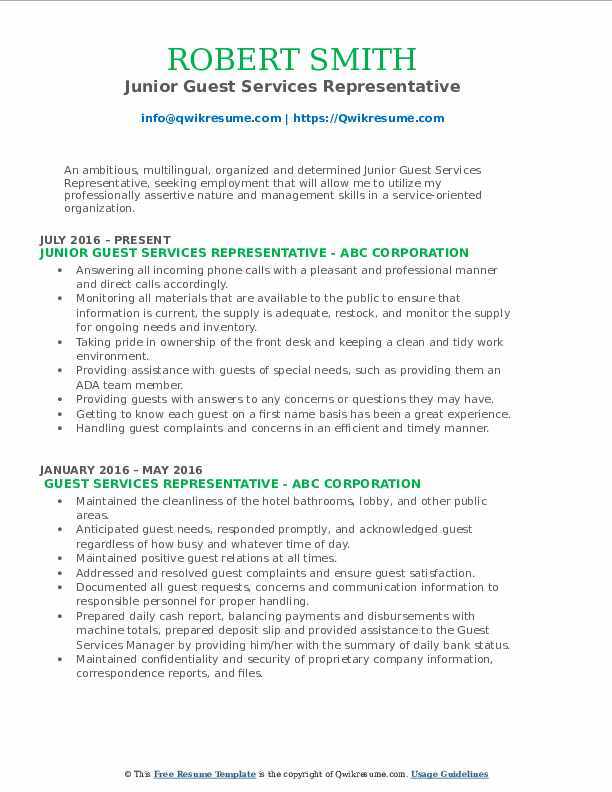 Working for the hospitality industry, the Guest Service Representative will offer exemplary guest service and also provide guests the needed service and information. 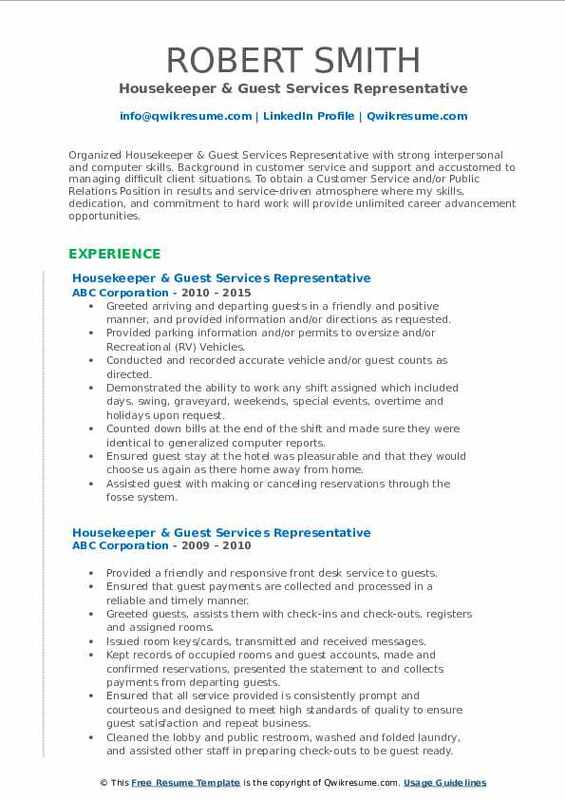 While the job description varies based on the industry and size, the Guest Service Representative Resume mentions the following core job tasks – greeting guests on arrival, handling the accommodation procedures; providing guests the needed information, solving complaints, promoting the hotel’s product and services, making arrangements for the subsequent services, and ensuring the registration procedures are executed appropriately. 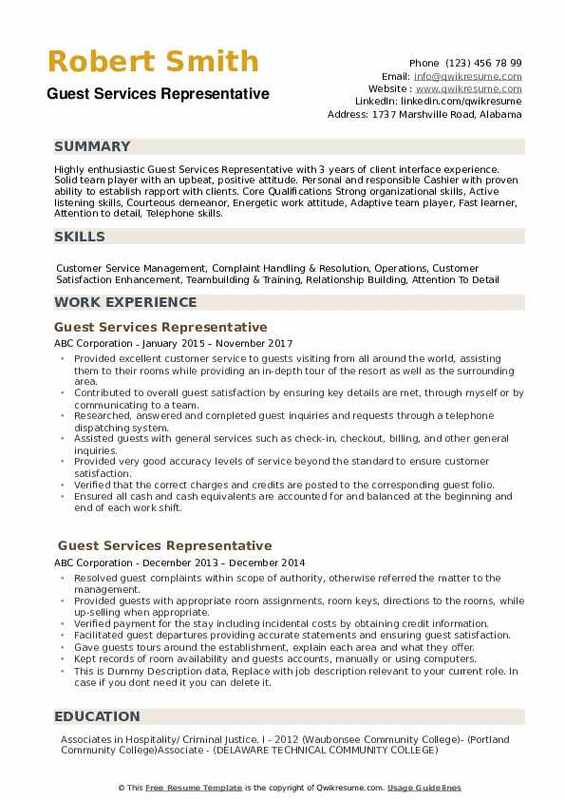 The ideal candidate for this post should depict the following skills and abilities – customer-centric approach, strong listening skills; the ability to foster a professional and healthy relationship with customers and internal members; good marketing skills, and ability to provide quality services. While not mandatory, qualifications such as a diploma in Hotel Management will be useful. 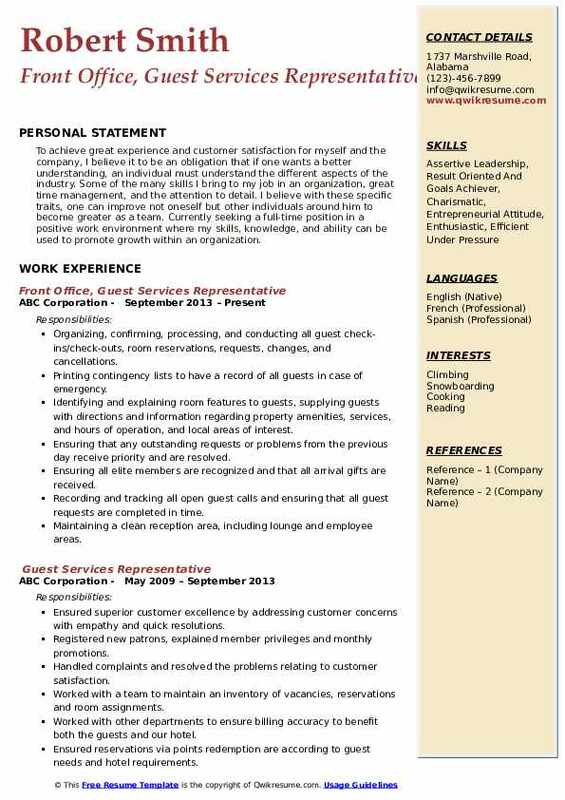 Objective : Dedicated Guest Service Representative motivated to maintain customer satisfaction and contribute to company success. Highly productive and performance driven professional with diverse credentials which combine solid and tactical problem-solving expertise with a strong customer service focused background, and ability to work collaboratively, with a commitment to achieving corporate goals. Organized, confirmed, processed, and conducted all guest check-ins/check-outs, room reservations, requests, changes, and cancellations. Assisted in breakfast and happy hour food-service, cleaned and prepared dining tables during food services hours. Operated kitchen equipment such as dishwasher, sanitizer, and industrial oven. Printed contingency lists to have a record of all guests in case of emergency. Identified and explained room features to guests, supplied guests with directions and information regarding property amenities, services, and hours of operation, and local areas of interest. Ensured that any outstanding requests or problems from the previous day receive priority and are resolved. Accepted and recorded wake-up call requests and delivered to the appropriate department. Processed all payment types, adjustment vouchers, paid-outs, correction vouchers, and miscellaneous charges; provide change. Welcomed and acknowledged all guests according to company standards, anticipated and addressed guests' service needs, assisted individuals with disabilities and thanked guests with genuine appreciation. Headline : Customer Service Professional Dedicated Guest Services Representative motivated to maintain customer satisfaction and contribute to company success. Over 5yrs of Customer service experience, excellent verbal skills, business-oriented, problem solving and analytical skills. Seeking a position that utilizes my expertise as a positive team player with great communication skills and the ability to establish rapport with internal and external customers. Duties included, but not limited: providing phone services and customer support. Utilizing computer programs such as, but not limited to Microsoft Word, Excel, Outlook, CCC One, Audatex, Mitchell, Abse, Internet Explorer, and Google Chrome. Billing out jobs, collecting insurance checks and deductibles, and completing insurance related forms. Going over the damage with customers on their vehicle to determine what is related to the loss or unrelated damage. Delivering finished vehicle to customers while going over the repair order with them and answering any questions they may have. Working with technicians and estimators to receive correct parts and update price changes. Answering multi-line switchboard phone and responded to customer inquiries. Working directly with the sales managers and general manager to solve problems quickly and effectively. 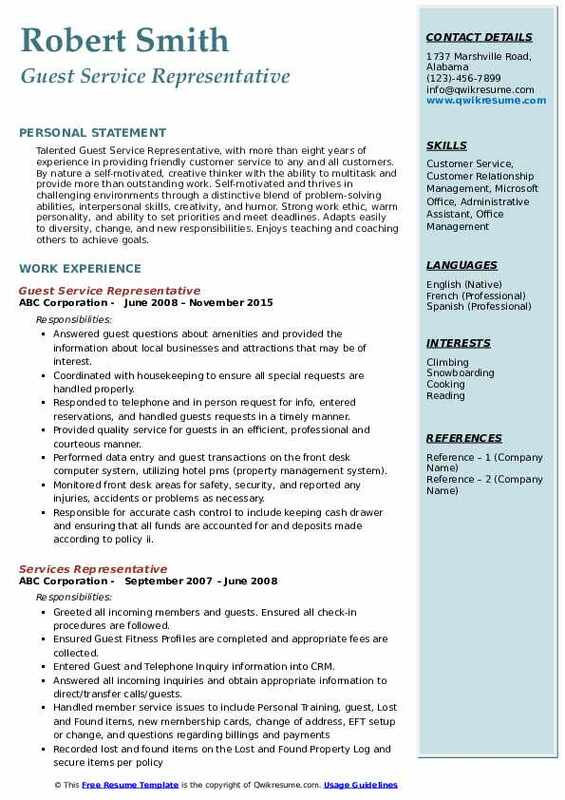 Headline : Organized Housekeeper & Guest Services Representative with strong interpersonal and computer skills. Background in customer service and support and accustomed to managing difficult client situations. 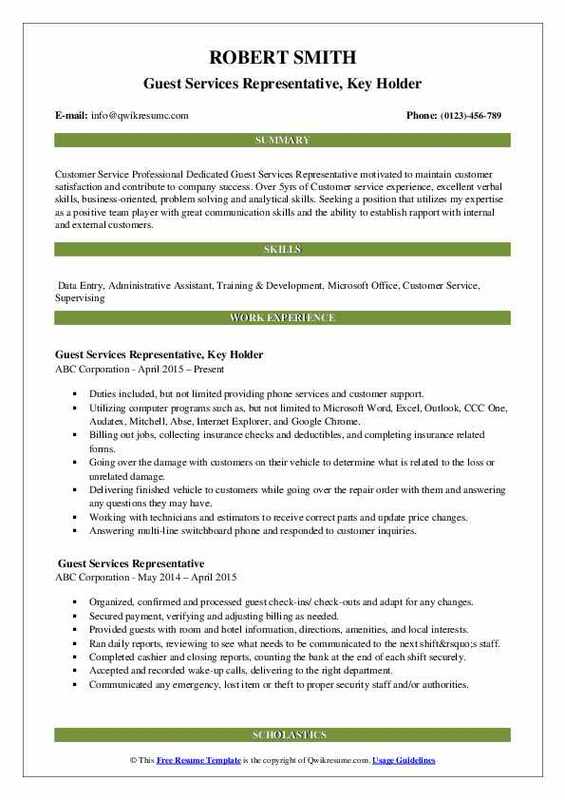 To obtain a Customer Service and/or Public Relations Position in results and service-driven atmosphere where my skills, dedication, and commitment to hard work will provide unlimited career advancement opportunities. Greeted arriving and departing guests in a friendly and positive manner, and provided information and/or directions as requested. Provided parking information and/or permits to oversize and/or Recreational (RV) Vehicles. Conducted and recorded accurate vehicle and/or guest counts as directed. Demonstrated the ability to work any shift assigned which included days, swing, graveyard, weekends, special events, overtime and holidays upon request. Counted down bills at the end of the shift and made sure they were identical to generalized computer reports. Ensured guest stay at the hotel was pleasurable and that they would choose us again as there home away from home. Assisted guest with making or canceling reservations through the fosse system. Demonstrated the ability to handle any given situation at any time with the utmost professionalism. Verified credentials any returning guests have/ making sure everything is valid (such as tickets, passes, credentials). 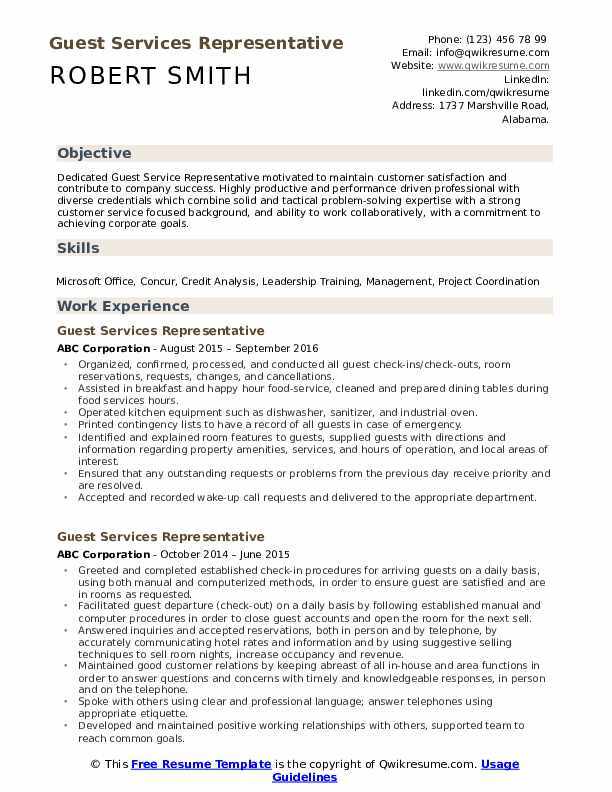 Objective : An ambitious, multilingual, organized and determined Junior Guest Services Representative, seeking employment that will allow me to utilize my professionally assertive nature and management skills in a service-oriented organization. Answering all incoming phone calls with a pleasant and professional manner and direct calls accordingly. Monitoring all materials that are available to the public to ensure that information is current, the supply is adequate, restock, and monitor the supply for ongoing needs and inventory. Taking pride in ownership of the front desk and keeping a clean and tidy work environment. Providing assistance with guests of special needs, such as providing them an ADA team member. Providing guests with answers to any concerns or questions they may have. Getting to know each guest on a first name basis has been a great experience. Handling guest complaints and concerns in an efficient and timely manner. Provide information and directions to local restaurants and attractions. Communicating with housekeeping, maintenance, and management to ensure guest satisfaction. 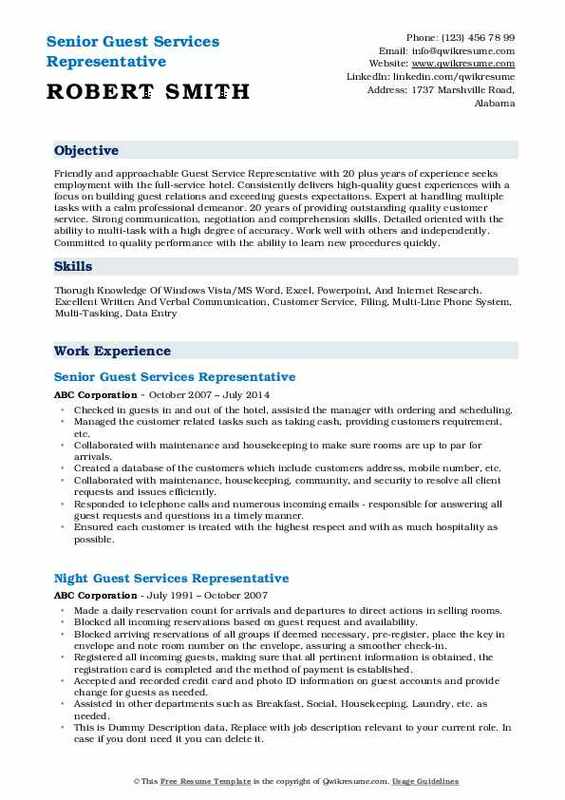 Objective : Experienced Guest Service Representative seeks full-time employment with a leading Vacation Rentals team. Consistently delivers the first-rate service and fosters positive relationships with guests to promote customer satisfaction and loyalty. Adept at balancing multiple tasks with a friendly, courteous demeanor. Highly organized and detail-oriented who continually maintains a positive attitude while interacting with demanding customers. Organizing, confirming, processing, and conducting all guest check-ins/check-outs, room reservations, requests, changes, and cancellations. Printing contingency lists to have a record of all guests in case of emergency. Identifying and explaining room features to guests, supplying guests with directions and information regarding property amenities, services, and hours of operation, and local areas of interest. Ensuring that any outstanding requests or problems from the previous day receive priority and are resolved. Accepting and recording wake-up call requests and delivering to the appropriate department. Processing all payment types, adjustment vouchers, paid-outs, correction vouchers, and miscellaneous charges and providing change. Handling large volumes of work and completing tasks accurately and timely while maintaining guest relations and resolving all guest complaints and problems. Processing cash, check and credit card transactions through a computer system quickly and accurately. Confirming all applicable reports have been printed at their respective times and turned into the appropriate departments. 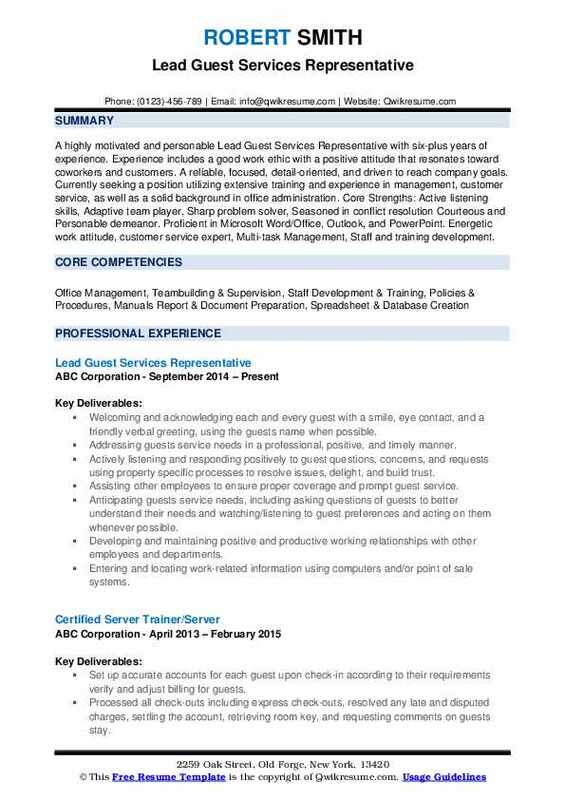 Objective : Highly enthusiastic Guest Services Representative with 3 years of client interface experience. Solid team player with an upbeat, positive attitude. Personal and responsible Cashier with proven ability to establish rapport with clients. Core Qualifications Strong organizational skills, Active listening skills, Courteous demeanor, Energetic work attitude, Adaptive team player, Fast learner, Attention to detail, Telephone skills. Provided excellent customer service to guests visiting from all around the world, assisting them to their rooms while providing an in-depth tour of the resort as well as the surrounding area. Contributed to overall guest satisfaction by ensuring key details are met, through myself or by communicating to a team. Researched, answered and completed guest inquiries and requests through a telephone dispatching system. Assisted guests with general services such as check-in, checkout, billing, and other general inquiries. Provided very good accuracy levels of service beyond the standard to ensure customer satisfaction. Verified that the correct charges and credits are posted to the corresponding guest folio. Ensured all cash and cash equivalents are accounted for and balanced at the beginning and end of each work shift. Managed phone activity including providing general knowledge to callers. Headline : A highly motivated and personable Lead Guest Services Representative with six-plus years of experience. Experience includes a good work ethic with a positive attitude that resonates toward coworkers and customers. A reliable, focused, detail-oriented, and driven to reach company goals. Currently seeking a position utilizing extensive training and experience in management, customer service, as well as a solid background in office administration. Core Strengths: Active listening skills, Adaptive team player, Sharp problem solver, Seasoned in conflict resolution Courteous and Personable demeanor. Proficient in Microsoft Word/Office, Outlook, and PowerPoint. Energetic work attitude, customer service expert, Multi-task Management, Staff and training development. Welcoming and acknowledging each and every guest with a smile, eye contact, and a friendly verbal greeting, using the guest's name when possible. Addressing guests' service needs in a professional, positive, and timely manner. Actively listening and responding positively to guest questions, concerns, and requests using property specific processes to resolve issues, delight, and build trust. Assisting other employees to ensure proper coverage and prompt guest service. Anticipating guests' service needs, including asking questions of guests to better understand their needs and watching/listening to guest preferences and acting on them whenever possible. Developing and maintaining positive and productive working relationships with other employees and departments. Entering and locating work-related information using computers and/or point of sale systems. Processing all guest check-ins by confirming reservations in the computer system (e.g., Fidelio, PMS, Fosse, Opera), verifying guest identity, requesting form of payment, assigning a room, and issuing room key in accordance with property policies and procedures. Summary : Talented Guest Service Representative, with more than eight years of experience in providing friendly customer service to any and all customers. By nature a self-motivated, creative thinker with the ability to multitask and provide more than outstanding work. Self-motivated and thrives in challenging environments through a distinctive blend of problem-solving abilities, interpersonal skills, creativity, and humor. Strong work ethic, warm personality, and ability to set priorities and meet deadlines. Adapts easily to diversity, change, and new responsibilities. Enjoys teaching and coaching others to achieve goals. Answered guest questions about amenities and provided the information about local businesses and attractions that may be of interest. Coordinated with housekeeping to ensure all special requests are handled properly. Responded to telephone and in person request for info, entered reservations, and handled guests requests in a timely manner. Provided quality service for guests in an efficient, professional and courteous manner. Performed data entry and guest transactions on the front desk computer system, utilizing hotel pms (property management system). Monitored front desk areas for safety, security, and reported any injuries, accidents or problems as necessary. Responsible for accurate cash control to include keeping cash drawer and ensuring that all funds are accounted for and deposits made according to policy ii. Verified that personal and payment information on guest accounts was accurate and complete. Summary : Friendly and approachable Guest Service Representative with 20 plus years of experience seeks employment with the full-service hotel. Consistently delivers high-quality guest experiences with a focus on building guest relations and exceeding guests expectations. Expert at handling multiple tasks with a calm professional demeanor. 20 years of providing outstanding quality customer service. Strong communication, negotiation and comprehension skills. Detailed oriented with the ability to multi-task with a high degree of accuracy. Work well with others and independently. Committed to quality performance with the ability to learn new procedures quickly. Checked in guests in and out of the hotel, assisted the manager with ordering and scheduling. Managed the customer related tasks such as taking cash, providing customers requirement, etc. Collaborated with maintenance and housekeeping to make sure rooms are up to par for arrivals. Created a database of the customers which include customers address, mobile number, etc. Collaborated with maintenance, housekeeping, community, and security to resolve all client requests and issues efficiently. Responded to telephone calls and numerous incoming emails - responsible for answering all guest requests and questions in a timely manner. Ensured each customer is treated with the highest respect and with as much hospitality as possible. Reviewed, completed and followed-up on reports or tasks assigned by management. Resolved any issues a guest may have with empathy ensuring guest satisfaction. Summary : To achieve great experience and customer satisfaction for myself and the company, I believe it to be an obligation that if one wants a better understanding, an individual must understand the different aspects of the industry. Some of the many skills I bring to my job in an organization, great time management, and the attention to detail. I believe with these specific traits, one can improve not oneself but other individuals around him to become greater as a team. 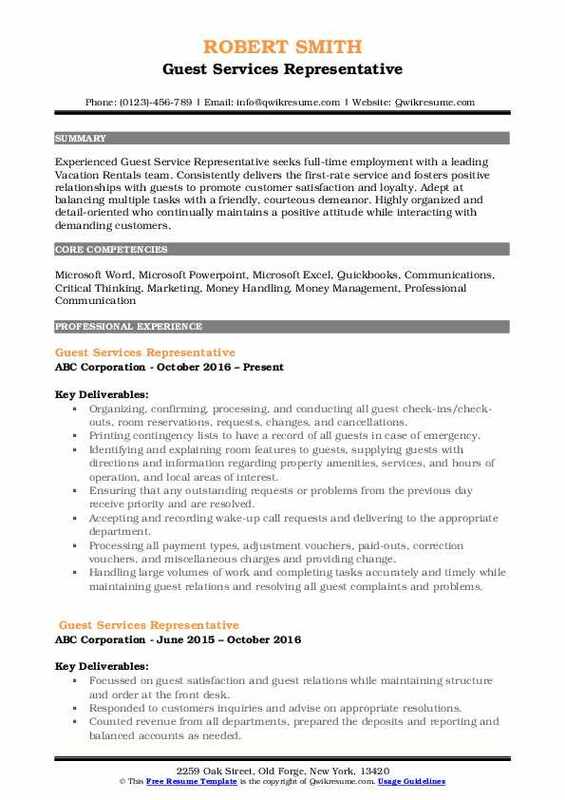 Currently seeking a full-time position in a positive work environment where my skills, knowledge, and ability can be used to promote growth within an organization. Ensuring all elite members are recognized and that all arrival gifts are received. Recording and tracking all open guest calls and ensuring that all guest requests are completed in time. Maintaining a clean reception area, including lounge and employee areas. Ensuring guests a seamless and warm experience while adhering to AAA five diamond award guidelines.